The ancient practice of nada yoga is not complex. It is the yoga of listening. It is a journey from the noise of the external world inward to a place of peace and bliss, to the source of the transformational power of sound--the nada. By meditating on the inner sacred sound of the nada, we can release ourselves from mind chatter and obsessive thinking. We can still the body, quiet the mind, and open the heart to create a state of mind where joy naturally arises. Sharing his experiential understanding of the classic Hatha Yoga Pradipika, Baird Hersey offers precise, step-by-step instructions on how to find the inner sound of the nada. He explains the first three levels of sound--first, how to truly hear the ordinary sounds of the world around us (vaikhari); second, how to quiet the sounds of the mind (madhyama), such as sound memories and internal dialogue; and third, how to access visual sounds (pashyanti), tapping in to our ability to see sounds and hear colors. Mastering the first three levels prepares one for the fourth level of sound (para), the heart of the practice that connects one to the inner sound of the nada. 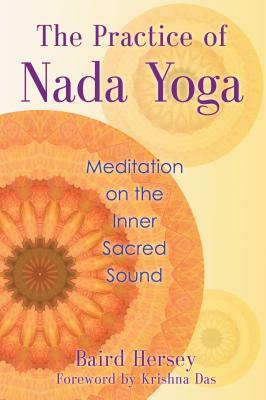 The author provides detailed exercises to guide you through each level of sound and instructions for a daily nada yoga meditation practice. Hersey explains that by focusing our minds on this internal sound we reunite our essential self with the eternal and infinite. In this re-union we find bliss in both body and mind, an uplifted spirit, and heightened states of consciousness. Baird Hersey is a musician and National Endowment for the Arts Composition Fellow. He has composed extensively for television and for organizations such as Harvard University and the Hudson Valley Philharmonic. A student of yoga and overtone singing since 1988, he studied ashtanga yoga with Sri K. Pattabhi Jois for 9 years, vedanta for 12 years with Swami Chinmayananda’s student Shubhraji, and chant with the Gyuto Monks of Tibet. In 2000 Hersey formed the 9-voice overtone choir PRANA, which regularly collaborates with renowned kirtankar Krishna Das. Baird Hersey lives in Woodstock, New York.